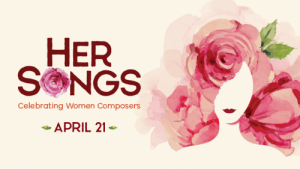 The Choral Society of Pensacola will celebrate the music of female composers with its presentation of “Her Songs Celebrating Women Composers” at 7:30 p.m. Saturday, April 21, at the First United Methodist Church located at 6 E. Wright St. in Pensacola. Showcasing music from the 17th century through the 21st century, compositions by six women will be presented by a 60-voice chorus. Selections will range from Italian opera to contemporary Chinese-American influences. Performances by two guest artists, mezzo-soprano Hanan Tarabay and Steinway artist/composer Kadisha Onalbayeva, will be featured. Under the direction of Pensacola State Performing Arts Professor Xiao-lun Chen, the Choral Society of Pensacola Chorus is made up of community volunteers. The chorus presents three or four major concerts annually and conducts a variety of other activities. Tickets are available at www.eventbrite.com. Special rates are available for groups and students. For more information, call 850-484-1800.